How to delete Facebook post: Delete a Facebook post with just a single click and get on with it. This article explains everything you should know about deleting a Facebook post. So if you mistakenly sent out a Facebook status on your timeline, you can delete it before others even get to see it. 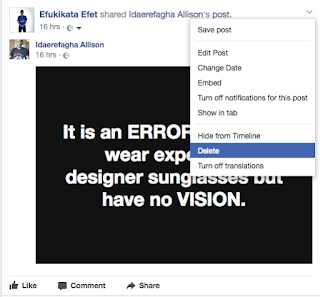 Note that there is a clear difference between hiding and deleting a Facebook post - Hiding a post that you've shared from your Page will remove it from your Facebook's Timeline and not from your Facebook's activity log. When you delete a Facebook post, you'll permanently remove it from your FB Page, including your Facebook Page's activity log. 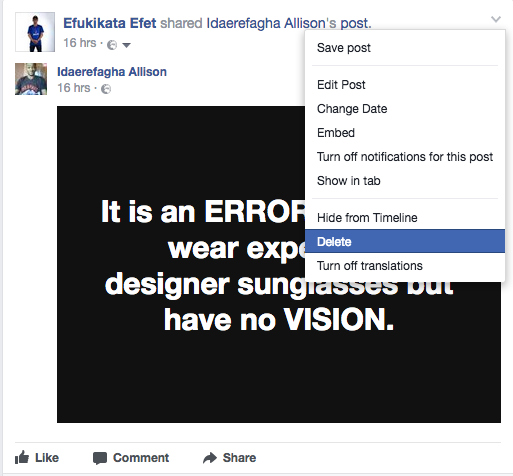 Please keep in mind that if a post you've hidden was shared, it may still be visible to the audience it was shared with in other places on Facebook, such as in News Feed and search. Any photos you've hidden from your Page's Timeline will still be visible when people visit your Page's Photos section.